You don’t need a large, sprawling garden to enjoy a crisp salad fresh-picked from your own plants. With careful choices and proper care, you can grow a healthy, delicious salad in just one pot! 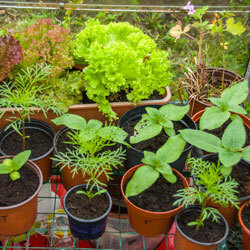 Ideally, larger pots with ample room for a variety plants are best for growing container salads. Deeper pots will allow for better root development and easier drainage to be sure plants don’t become waterlogged. A taller pot can also be easier to cultivate, without the need to crouch down to tend the plants or harvest tasty bites. 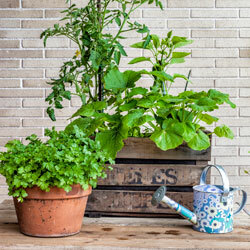 Taller pots will also permit more use of trailing, overhanging plants that will maximize your growing space. So long as it is a good size to accommodate your salad choices, any type of pot or container can be suitable for growing a salad. Clay or ceramic pots are beautiful options, but you may prefer plastic pots because they are lighter and easier to move around. For more rustic choices, consider using half-barrels, a wheelbarrow or a galvanized tub. If you don’t eat a lot of salad but still want to grow your own, you can even use a window box. Round or oblong, rectangular or square, any shape of pot can be suitable for salad growing as long as it meets the plants’ needs for space and drainage. You may need to drill, punch or poke holes in the bottoms of solid containers to be sure they have suitable drainage. For larger, heavier pots, you should also consider pot feet, casters or rolling stands so you can more easily rotate the pots for even sun exposure and to relocate the pot throughout the season for the very best growing conditions. 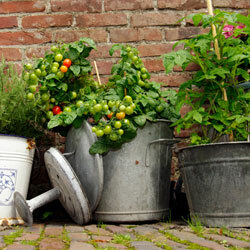 Any plants you enjoy in salads can be grown in pots for an attractive and practical arrangement. Growing a container salad is also a fun opportunity to try new plants for unique flavors, which can make you even happier to be adding more healthy greens to your meal plan. Tasty greens are the basis for any salad, and you can grow many different types of lettuce in a pot. For more variety, consider including spinach, Swiss chard, kale or endive to liven up your salad’s leafiness. Add more tastes and textures to your salad with a variety of vegetables. Tomatoes, radishes, onions, carrots, cucumbers and banana peppers are just a few salad-friendly options that do well in pots. For a salad with a sweeter side, nothing beats fresh berries. If you’re using a larger pot you will have plenty of room for strawberries, raspberries or blackberries to add a sweet and tasty tang to your salads. Raspberry and Blackberry plants can get rather large so choose dwarf varieties. There are many edible flowers that can add a colorful burst to your pot and a unique taste to your salad. Consider Calendula, Nasturtium, Hibiscus, pansies and violets as well as lavender to add colorful flavors to your salad. While you can’t grow the oil or vinegar for your salad in a single pot, you can use fresh herbs to give your salad a finished flavor that is even healthier and more fragrant. Chives, basil, cilantro, dill, mint, parsley and other herbs do very well in container salads. When choosing which seedlings to add to your salad pot, opt for plants with similar growing requirements so they can all get the proper care. If necessary, you might have several pots growing different salad components so you can have even more variety and a bigger harvest. It’s no more difficult to care for a container salad than any containers you may grow. To ensure your plants are as lush and lucrative as possible, use a rich potting soil with plentiful nutrition and adequate drainage. For very large pots, you may want to add a small layer of gravel to the base to improve drainage and help balance a taller pot so it won’t accidentally tip. Position the pot in a sunny location, but protected from the harshest weather conditions. When planting your salad seedlings, don’t be afraid to crowd them a bit, since you will be harvesting them throughout the season, which will improve air circulation and provide more room for fresh growth. Provide regular fertilization, opting for a formula with more nitrogen to encourage stronger foliage growth for even more harvestable greens. Water the container regularly, and consider using a drip system to help keep the soil properly and evenly hydrated. When the plants are very young and delicate, you may want to cover them with a layer of wire mesh to keep pests away, and you’ll need the proper hand tools to carefully weed your salad pot until the plants are large enough that weeds are no longer a concern. To keep your salad growing richly on all sides, rotate the pot regularly so the sunlight reaches all plants evenly. Take care to move the pot as needed throughout the growing season as light exposure and shadows change, and you’ll lengthen the growing season and be able to harvest even more salads. Thinning your plants with every salad you create will keep your pot growing deliciously. You can harvest baby greens and younger plants, and you’ll discover delightfully different tastes with plants at different levels of maturity. Try different combinations of plants for every salad, and you might be surprised at how eager you are to try new and different salads with every harvest and every meal!